Festoon lights are super stylish and really suit the rustic appeal of the large tithe barn at Ufton Court. What better way to incorporate them into a wedding decor scheme than a large, loopy overhead lighting canopy? Combined with controllable LED uplighting, these elements came together spectacularly to transform the barn for this recent wedding! 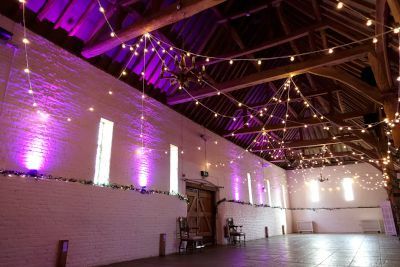 This pretty lighting canopy uses hundreds of metres of festoon lights, hung around the barn in lots of random loops of varying sizes and heights and taking full advantage of Ufton's natural features such as the oak beams and the row of wooden pillars to create a visually interesting display of lights. Each of the several hundred bulbs is a sparkly warm white in colour and they're fully dimmable to set just the right mood in the evening. LED uplighters positioned around the walls of the barn reflect warm white or coloured light off the barn's white walls, giving impressive plumes of light rising up into the ceiling. The supplied controller allows the flexibility to choose between white, a colour (including pastels or bold colours), or colour-change, plus the ability to dim the uplighters. Using the controller allows all of the lights to be changed easily and simultaneously at any time during the day or evening. 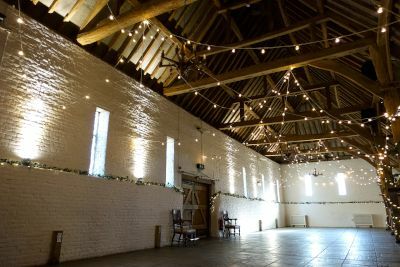 We love working at Ufton Court and would be delighted to share more ideas and photos of our previous work. If you're getting married at Ufton, why not get in touch with us to request a brochure?